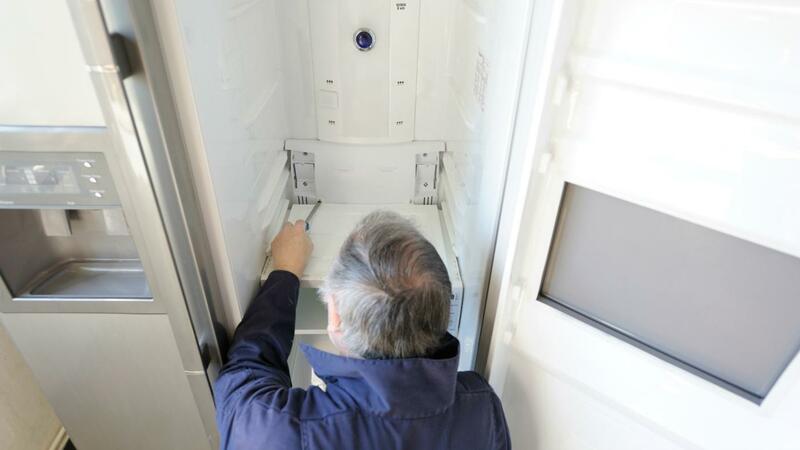 Some in-home refrigerator repair services include the Best Buy Geek Squad and Sears Home Services. Both companies can come to the home for repairs, no matter where the homeowner bought the appliance. Best Buy's Geek Squad charges about $100 for the initial visit to repair a refrigerator, as of 2015. In some cases, the technician can fix an issue during this first visit, but in other cases, an additional appointment is necessary. Sears Home Services also charges for an initial visit, but the price depends on the type of repair and the ZIP code. The cost can be obtained online by filling out the appointment request form. Where Can I Find an Oven Repairman? Where Can I Find a KitchenAid Refrigerator Repairman? Where Can You Buy a GE Energy Star Refrigerator? What Are Some Companies That Can Repair a Treadmill? Does Sears Offer Repair Services for Electrolux Dryers?